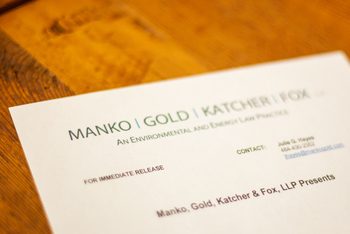 Kate Campbell, a partner with the environmental, energy and land use law and litigation firm of Manko, Gold, Katcher & Fox, LLP (“MGKF”) located just outside of Philadelphia, PA, participated in a panel on “The Migrating Impact of Vapor Intrusion” on April 27th. This teleconference was sponsored by the American Bar Association’s Section of Environment, Energy and Resources (ABA SEER), Superfund and Natural Resources Damages Litigation Committee and Environmental Litigation and Toxic Torts Committee. MGKF Partner John Gullace served as the moderator for the program.